Big Agnes Fly Creek HV 1 Platinum Tent. 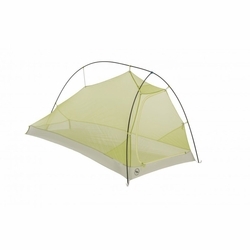 Incredibly lightweight and technical, Fly Creek Platinum tents utilize the latest in fabric and pole technology. Climb mountains, explore new territory, bikepack the length of the North American West Coast, or packraft into the wildest backcountry canyons. Do it all with the Fly Creek Platinum Series. They’re a sign of our commitment to help you travel lighter, faster, and better prepared for whatever nature throws your way. If you want the lightest, free standing, double-walled tent available then look no further.